After a lovely holiday in the States with lots of beach/pool/family/friends time, I flew out of Boston on Sunday, arrived in London on Monday then flew to Rome on Tuesday. I plan on studying Italian for the next month (or two) and searched Craigslist (which has come a long way since the last time I lived here) for an apartment. It came down to two places: a less-expensive one with air-conditioning, and one in a cool area where I could walk everywhere. I chose the latter and am so happy with my decision. 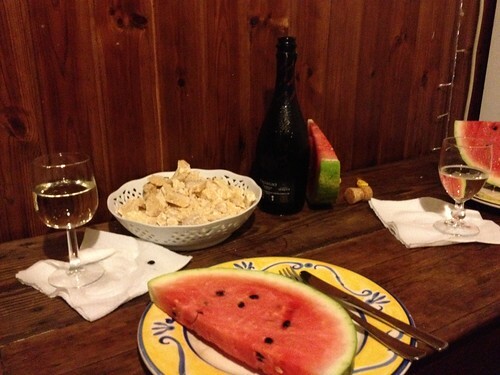 These things are always a gamble, but when I showed up (after taking the train then tram from the airport) my landlady welcomed me into her home with watermelon slices and a bottle of Prosecco, which we shared. Then, perhaps because we were tipsy, she gave me the most thorough tour of an apartment I’ve ever had. Rather than toss me the keys and wish me luck, she made sure I could lock/unlock the front door (not always easy in Italy, where wonky keyholes can be hundreds of years old). She showed me where everything was in the kitchen (scissors, can opener…all stuff I would have wasted a ton of time searching for in the next week) and how to work the stove, washing machine, dishwasher. The apartment is all books and paintings and wind chimes and even though Italy is hot as hell, my room is bearable if I keep the green shutters closed in the day. My landlady, Adriana, made sure to give me candles for atmosphere and I also have a lamp made of pink quartz (it’s literally a piece of quartz with a lightbulb inside). Antiques are everywhere and our toilet has moons and stars all over it. The only downside of the place is the noise outside my window and my warped mattress, but I’ll deal. That’s why God made earplugs and sleeping pills. I love it here!